Able to fit most designer sunglasses up to 6 inches long, the Hard Sunglass Case features a full grain leather tab closure secured by a piece of natural suela leather that will patina beautifully with time and use. Initially, because of the toughness of the suela leather, the closure may require a little finesse to close. It will become easier as the leather softens and forms to the closure. 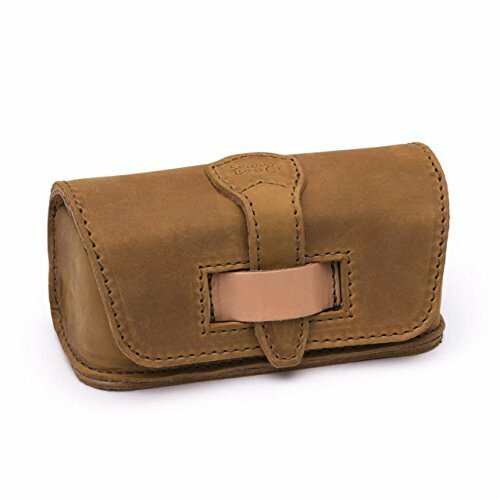 Although the Hard Sunglass Case was designed specifically to protect sunglasses, this good- looking leather case can be used for many other applications. A few popular applications used by our customers are as a pen/pencil case, makeup case, small tool case, travel passport case and many others. Available in Saddleback's 4 Leather Finishes: Tobacco (Tan), Chestnut (Red-Brown), Dark Coffee (Dark Brown) and Black. We built the Hard Sunglass Case to last AT LEAST 100 years. All our leather designs are field-tested to handle stampeding bulls, your daily morning commute and small children. Whether your adventure takes you across the Serengeti or uptown on the A train at rush hour, if this leather case goes before you do, we'll fix it or replace it for free. 1. BEST PEOPLE - The quality of our leather sunglass cases is only as good as the people who make them. We employ the best leather artisans in the business. 2. BEST LEATHER - We only use the most expensive, premium, 100% full grain leather sourced from reputable, environmentally friendly tanneries. 3. BEST THREAD - We use extremely strong, marine-grade polyester thread that is both UV and saltwater resistant. You'll find the same thread used in boat sails and parachutes. 4. BEST PARTS - All our hardware is strong stainless steel 316 that will never degrade. We never use snaps, magnets, zippers, velcro or rolling wheels, which all eventually break, on any of our leather designs. HIGHEST QUALITY MATERIALS - All Saddleback Leather Co. products are stitched with marine-grade polyester thread, which is 4 times as strong as commonly used Nylon thread and reinforced with copper rivets for super durability. It is lined with tough but soft pigskin lining, that is even stronger than cow leather and all hardware is surgical-grade stainless steel 316. 100% FULL-GRAIN LEATHER - Our Products are crafted from tough, 100% full-grain leather, which takes hits well and looks even better with age. Full-grain is the top layer of the cow skin, which is the most expensive and durable part. Much higher quality than genuine leather, our leather becomes soft and supple as it ages. UNIQUE DESIGN FEATURES - All of our products Includes many unique Design features, that prove Saddleback Leather Co. to be one of the most functional over engineered bags in the world. SATISFACTION GUARANTEE: Not Satisfied? Wrong color or size? Return within 30 days for a 100% Full Refund.